Is it possible to share different folders to a custom location with windows? Many of us use Dropbox, Google Drive and many more to share files. But there is no option to add “multi folder” syncing. Let’s take dropbox for example. The default folder location to sync is at: “C:\Users\Dropbox”. What if I want to add other folders in other location that I want to sync? There is no option for that for any cloud service (as far as I know). Is it possible to add another option, like: Share with Dropbox. Or even make Dropbox look like a “user”. I was also thinking, is there any way to edit the Network Path of a folder, by adding multi paths (if you right click on a folder, properties > sharing; you will see the network path). I think by editing or adding a path will share a folder with a specified location. To conclude, I was thinking all this for one purpose: not having to copy folders (or move them), to the dropbox folder. Copying folders will result in more drive space filled. Moving them it’s not an option, because I want the folders in the location I already have. Don’t recommend me software like ‘Dropbox Sync Folder’ or the likes. What they do is that they create a ‘link’ to the original location, moving the original folder to the dropbox location and keeping the file properties. If you click on folder properties you will see it as a normal folder, not a link. And also the size is the same. But actually what it is doing is showing you the properties of the folder in the Dropbox location, not the “link”. If I am wrong about it, please tell me! I think the problem is that most of your requests are already meat by the known services but only one or two are different ~ something you'd have to compromise on. For example the easiest way to share things with (the same) other people is to create a folder within Dropbox e.g. "group1", share this folder with the other people and whenever you want to share something with those people you can add it (move it) into that location. Technically it sure is possible to have things residing outside the Dropbox folder yet have them synced. For example if those two locations reside on the same volume you can use hard links. Files will simply appear to be in both locations but they are only stored once on the drive. Dropbox is also intelligent in syncing symlinks/Junctions. Dropbox will automatically follow the linked file structure and sync all of it's contents to the cloud. The little drawback is that a changes are only pushed to the cloud once the Dropbox app is restarted. I'm not sure what you were trying to say or ask with the sharing properties. 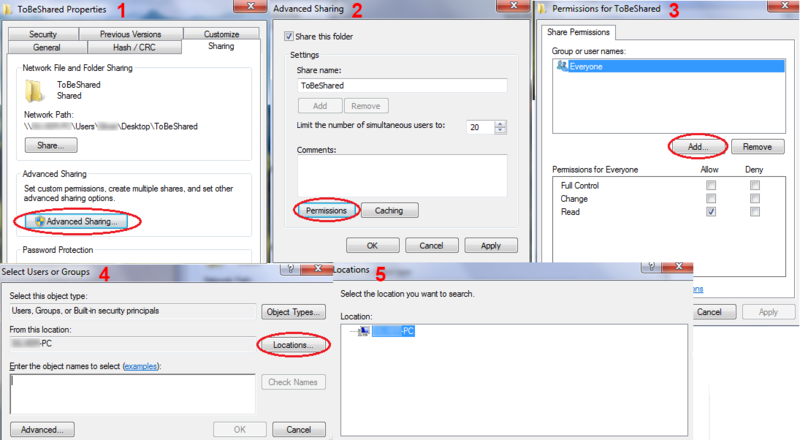 The sharing path is exactly what it should be "\hostsharename...location_within_share...". To change the host you have to copy the file to the other actual host, the sharename can be edited within the share properties and to change the location you can e.g. move the file within the shared folder. But all of this has nothing to do with what you are trying to do ~ at least nothing I can see? Your logic isn't entirely correct. Moving folders to the Dropbox folder doesn't take up more space. It frees up space in one location and uses it up in another one. If those two locations are on the same partition nothing changes at all. If they are on the same physical drive but different partitions then one will gain free space, one will lose it. The question is why is the space a concern? If you have a small SSD as your system drive then I assume you have a secondary large drive on your system you could move the entire Dropbox folder too? If the files or folders in question reside on a network share I suggest you install Dropbox on that system or device. Otherwise you just create a lot of unnecessary overhead and utilization as files would always travel from the network share > your device > cloud and the same way back. The problem it's not on the space on disk itself, it's on the folder locations. What I want to do is keep the folders organized as I already have them, and select to synchronise some and some not. Or better saying, adding other folders from other volumes inside dropbox folder, so they can be synchronized. Another option would be to have the entire computer be the dropbox folder, and select the folders you want to sync or not. That is also not possible (since computer it's not considered as a folder). Still, you can make the entire volume as a dropbox folder, but still you can't share files to be sync from other volumes. I took dropbox as an example, but I was talking for the sharing option from the windows point of view. To understand more of what I was talking, I took a screenshot. I did some research and I understand it’s probably impossible to do this, but it will make a big difference in the way you share your files, if it can be made possible! How do I sync multiple folders on my computer? Erlis, if I understand you correctly, you want to sync (not to share) an number of folders to the cloud, which may be stored in arbitrary places (e.g. not within the Dropbox folder). You can do this with SugarSync and probably other cloud-sync services. While you can share any and all items that are sync'ed in SugarSync, it's not possible (in SugarSync or any other system I know of) to share multiple, disparate folders "in one go" with other people. You can place them all in one folder directly or you can create a folder and put hard links to the folders in it, but then again you're sharing a single "item" - the top folder. Thanks for suggesting me SugarSync. I took dropbox as an example, but I was talking for the sharing option from the windows point of view. To understand more of what I was talking, I took a screenshot. I did some research and I understand it's probably impossible to do this, but it will make a big difference in the way you share your files, if it can be made possible! Thanks for the screenshot; very helpful! Windows file sharing is actually quite different from cloud-based sharing, but the same problem applies. Each resource (in this case, read "shared" item is described in terms of its path (C:foldersubfolderetc), so unless they're all in the same folder, you have to share them separately. As mentioned elsewhere, you can use hard links, symlinks and junctions to place different resources into a single folder virtually (while the originals remain in their place), so this would solve the problem, so that would help to get around that restriction. Also, another way of sharing would be to use Bittorrent Sync, which syncs machines without the need to upload to the cloud. This obviously has some advantages (no need to copy files to the cloud before they can be shared, not storage limit, arbitrary storage locations) but also disadvantages, the most obvious of which is that the "master" machine has to be left switched on for the others to be able to sync to it.